For the first time in Telangana, Adivasis have flown the Gondwana flag at Durvaguda in Indervelli mandal in Adilabad district on Tuesday. The event is significant given the more than six-month-old friction between the aboriginal and Lambada tribes. The flag was hoisted by Soyam Bapu Rao, president of Adivasi Hakkula Porata Samithi (Tudum Debba) — an organisation of aboriginal people in Telangana. This is also significant in the backdrop of the stand-off between Adivasis and Lambadas. More important however, is the association of the flag with aspirations of the Adivasis, especially the Gonds across Central India. The flag is central to the demand of the ethnic people for a separate Gondwana State, though the voice is comparatively muted. 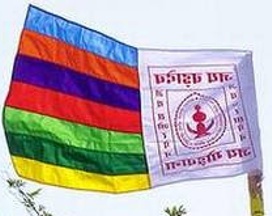 The seven coloured flag also carried the image of Bada Dev, the clan god of different denominations of Gonds. According to Chahkati Krishnamurthy, a youth who is considered savvy about religious and other affairs of the Gonds, the flag was given to the tribe by the founder and hero of Gonds — Pahandi Kupar Lingo. “He gave the colours which are in tune with nature. The life of Adivasis is in tune with nature,” he opined, while tracing the history of the aboriginal people in Gondwanaland. Mr. Bapu Rao touched upon the pathetic condition of Adivasis in Adilabad. He squarely blamed the State government for the problems dogging the ethnic people.